Library 2.0 的議題在國內外已經有數年的討論了. 關於命名當然跟 Web 2.0 有關, 但是整體概念的演進早在 Web 2.0 被 Tim O'Reilly 拋出之前. A library is a collection of information, sources, resources and services, organized for use, and maintained by a public body, an institution, or a private individual. In the more traditional sense, it means a collection of books. This collection and services are used by people who choose not to — or cannot afford to — purchase an extensive collection themselves, who need material no individual can reasonably be expected to have, or who require professional assistance with their research. 目前常見的 Library 所採取的做法是, 由 Maintainer Role 負責為 Library 內的各種 contents, 例如 books, 事先以特定的分類方式作分類, 然後 User Role 必需去學習這樣的分類方式, 以便有效率地進行搜尋以取得想要的 contents. Maintainer Role 除了要負責維持 Library 的 functionality 運作之外, 同時也負責設計及實施 classification scheme, 而 User Role 是在 Maintainer Role 所決定的 Classification Scheme 下所使用 Library. 我認為之所以會產生這些 imperfect 問題的原因, 其實跟過去基於人力所能負擔的 effort 有限, 以及 Library 是實體的 ( Physical ) 有關, 例如圖書館. 由於過去主要以人力進行管理與維護, 因此如果 classification scheme 不由 Maintainer Role 所掌控, 並強迫 User Role 依照統一的 scheme 使用, 則為了應付不同 Users 的需求, Library Maintainer 必須花費相當巨量的 efforts 來提供服務, 但如此一來 cost 也相對大量增加, 這將與 Library 概念的初衷之一, 減少整體社會接觸知識所需要的 cost, 產生相違背的情況. 在 Computer 被發明並普及化後, 其實我們應該回頭去思考, 是否可以利用 computer 的 computation power, 重新去改進過去限於人力考量, 所無法圓滿解決的 Library 問題. 利用 computer 的特點在於, (1) computer 具有較為低廉的 computation power, (2) 基於 computer, 許多 Library contents 得以數位化 ( digital ) 的形式存在, 以及被取用. 底下稱呼利用 computer 來解決的做法為 digital solution. 鑑於 application context 的不同, 我認為 digital solution 可以分為下面兩者, 兩者的差別在於 Library 內所管理的 contents 是否具有實體而定. 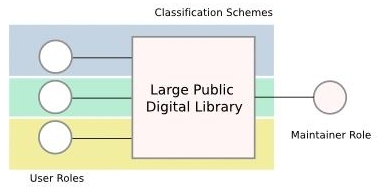 Semi-Digital Library : 其內的 contents 仍然具有實體, 因此我們不可能使用不固定的 classification scheme 來管理這些 contents, 在實體世界中必然要選擇一種 scheme 來管理這些實體 contents. 但是對於 User Role 在進行搜尋來說, 由於可以把這些實體 contents 以虛擬的物件 ( Virtual Object ) 來表示, 因此在 User Role 端可以保有自己的classification scheme, 透過 computer 進行管理, 不需要花費 Maintainer Role 的 effort. 因此在此 solution 下, Maintainer Role 的責任略小, 只負責實體 contents 的管理, 以及 Semi-Digital Library functionality 的正常運作. Digital Library : 其內的 contents 完全是 digital contents, 因此完全可以使用 computer 進行儲存以及其他管理. 因此在 classification 部分, Maintainer Role 完全不需要介入, Maintainer Role 將只需要負擔維持 Digital Library 的 functionality 正常運作的責任即可. 而 classification scheme 將完全基於 User Role 運作. 上述的 Semi-Digital Library 以及 Digital Library 兩個 solutions 之共同特點在於, 利用 computer, 將 classification scheme 的調整以及決定, 曝露 ( expose ) 給 User Role. 進而 classification scheme 有機會具備 personalization 的特性. 而回頭去看 conventional solution 中的 imperfect 部分, 將可以藉由此種方式被滿足. 另外在此想特別針對較小的 Library 討論其應用 digital solution 之後的改變. 如果有一個夠小的公共圖書館, 是由一個人單獨維護管理 ( 包含選書以及整理 ), 則透過仔細觀察這個圖書館裡的書, 你將能夠窺視管理者的個人思維. 許多小型的 Libraries 事實上具有特殊的用途, 可能是學者或是作家私人的參考資料庫, 或是一個實驗室共用的圖書研究資料蒐藏, 一個機構的歷史文件彙整等等. 因此裡面所放置的 contents相當程度反映了 Maintainer Role 或是 User Role groups 的相關訊息, 極有可能這些 contents 本身就具有一定的相關度, 而此相關度反映在使用該 Library 的 users 身上. 同時這樣的小型圖書館有一個極大的特點, 在於 User Role 的使用方式以及用途有極高的相似度, 使得嘗試統整所有使用者的 classification scheme, 以及 logic, 來為彼此的搜尋提供幫助, 具有很高的可行性以及實用性. 然而這在 conventional solution 中較難以實現, 理由是各 Users 的使用觀點事實上會隨著時間而有所變動, 進而牽動整個 group 的整體共通觀點改變, 換句話說這樣的改變是動態地, 隨時發生的, 且是藉由許多 Users 的意見交錯協調條而達到一個穩定的狀態 ( Stable Status). 在 conventional solution 中, 這樣的改變較難以達到, 因為這需要所有 Users 定期舉行會議, 討論大家都可以接受的 classification scheme, 相當地耗費時間. 相對來說, 在 digital solution 中顯然就較為容易做到, 藉由 computer 以及 network 的幫助, Users 的使用模式以及使用邏輯 ( Logic ) 可以被紀錄與分析, 進而彼此影響, 達到一個 group 內共享的觀點. 而且此共享的觀點可以隨著 Users 端的改變而動態地調整. 而在此同時, 各 Users 保持有自己的觀點仍舊是可能的. 而由此觀點而言, Semi-Digital Library 以及 Digital Library 使得 Library 不再只是靜態的 content data 的分類存放以及取用場所, 而是轉變為 group 內 users 的意見彙整平台之一, 透過在 Digital Library 內分享觀點, Digital Library 轉變成為引導 group 前進方向的動態角色之一. Large Public Library 的情況就與 Small Library 的情況不盡相同. 差異在於 Large Public Library 的使用者通常較多且雜, 使用目的也差異較大, 因此利用 digital solution 可以達到的好處應該會比較偏向 personalization 部分. 然而在統計數據的支持下, 或許可以考慮把 Large Public Library 切割成數個 clusters, 然後將每個 cluster 視為 Small Library 來處理. 在此情況下, 需要每個 cluster 有固定的 Users 才可行. 目前在 Web Recommendation System 上已經出現了類似的概念被實現, 例如 Reddit, Mixx 都有讓使用者建立自己的 Community 的能力, 而 Digg 也準備跟進. 當然這只是在 Web 的部份而已. This entry was posted on 上午7:51 and is filed under data and knowledge engineering , web engineering . You can follow any responses to this entry through the RSS 2.0 feed. You can leave a response, or trackback from your own site. 訂閱其他的 blog, 自己寫 blog, 還有 rss feed, traceback, 這些好像變成現代科技人日常資訊交流都會用到的東西. 你覺得, blog 這樣的知識型態, 會不會發生什麼樣的演進呢? 如果用了 "知識型態" 的觀點來看, 等同於是把 blog 看成一個表達 "個人知識" 或 "團體知識" 的媒介--過去是私人難以取得的媒介. 而 subscription/traceback 的行為代表的是知識流通的便捷化與具體化, 獨享的知識本身意義不大, 必須適度流通才有意義. 但是從這個角度看, 又覺得跟過去其實沒什麼差別, 只是知識散播的權利在知識階級中的移動, 使得我們可以更加自由的決定要看甚麼, 要聽甚麼, 要說甚麼, 要相信甚麼. 但, 很類似的情況, 百年來民主國家有甚麼重大的演進嗎 ? 我是認為短期內在 blog 的 "功能性" 上會比較有演進的空間. 目前的 blog 大抵是單向的主動知識供應角色, 如果我們認為 blog 是一種知識型態, 那麼是否撰寫 blog 也可以變成一種被動的知識供應行為呢 ? Blogger 就是當然的知識製造者. 而被動意味著是在自由意識下為了滿足某個特定目的或需求而撰寫 blog. 這樣一來 blog/blogger 就會從無特定目的地展現 capability 變成有目的地展現 functionality, 進而成為一種 on-demand knowledge service provider. 底下的爭論好多, 雖然我也同意 life-streaming 只能算是一種 blogging 方式, 不算是全新的 blogging. 這個問題越想越有趣, 如果以知識組織的角度來說, 目前的 Blog 系統提供的支援都還很弱, 也許朝向這方向的演進也是可能的. 例如提供類似 MindMap 之類的整理方式.